It is a rare event when an assiduous researcher from a different corner of the world makes contact with a rare book librarian, and that the two benefit equally regarding their work in progress. A recent exchange with Mr. Bob Oldham of Ad Lib Press, who is currently conducting a worldwide census of Columbian hand presses in observance of this year’s 200th anniversary of their invention by George Clymer, is clearly an expert on the subject matter and offered some new facts about its manufacture. At this stage of our contact, Mr. Oldham is investigating our Columbian Press which will be recorded in his detailed census as well as in the North American Hand Press Database. William Savage’s, Practical Hints on Decorative Printing, 1822. Our Columbian Press is one of five presses that the McGill University Library owns. It is without a doubt the most alluring of all the presses. It stands proudly on the fourth floor of the McLennan Library Building, in the corridor off the stairway. As for the design of the press, Clymer incorporated iron-casting techniques for its manufacture. It is lavishly ornamented with symbolic pieces in bronze and gilt such as the serpents on the levers which emblematize the virtue of wisdom, and the imperial eagle atop with extended wings representing might and power, clutching an olive tree branch and a horn of plenty, representing peace and abundance. Former University Librarian of McGill University, Richard Pennington called it “phantasmagoria in cast iron” in his Account of the Redpath Press, 1977. In this same account by Richard Pennington, we learn about the provenance of our Columbian Press. It was reportedly discovered in a basement in Fetter Lane, London, which had been “opened up by WWII bombardments” and re-located from London, England to Montreal Canada in 1957. 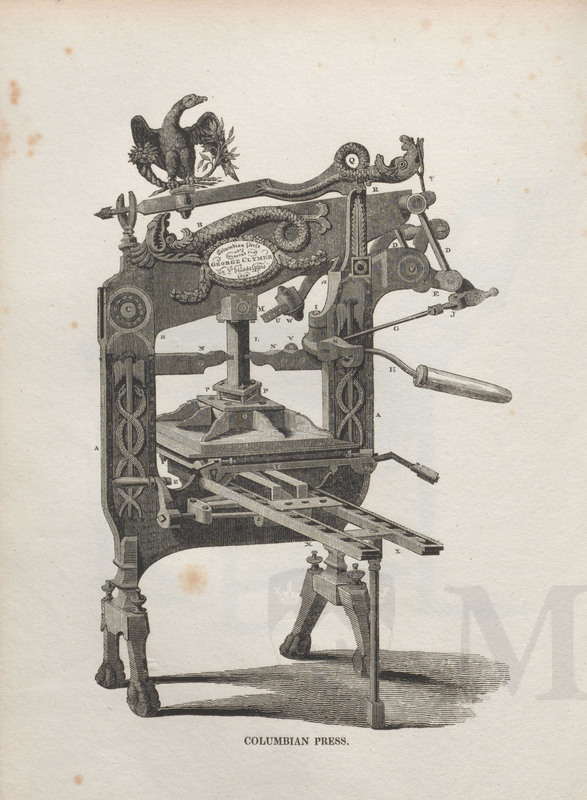 It was determined to be a pre-1824 model and therefore probably manufactured by Clymer when he was in England due to the fact that the first type of these presses had the bar pivoted on the off or far side of the frame. In the post- 1824 model, sources say that this flaw was remedied so that “ the bar was placed nearer the hand of the pressman.” It occurred in both locations in 1820 and 1828, according to Mr. Oldham, so dating can be problematic. We are most proud to house this historic monument to typography and scholarship. At the Bouquiniste. 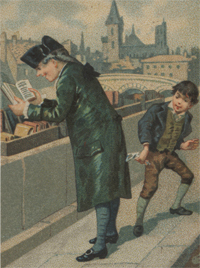 An inattentive victim of bibliomania loses track of his money in two ways. 8o 264 Rare Books/Special Collections - European Print Collection. This work is licensed under a Creative Commons Attribution-NonCommercial 2.5 Canada License.